The last time we met over this, we were discussing how Adventure Time had crunched their entire first season into a 2-disc DVD, and how Regular Show crunched their most memorable episodes into their “Slack Pack” DVD. Well, believe it or not, just hours after the release of that post, I found more news. And I was flabbergasted when I saw that I’d have to be making a sequel to my already successful original. 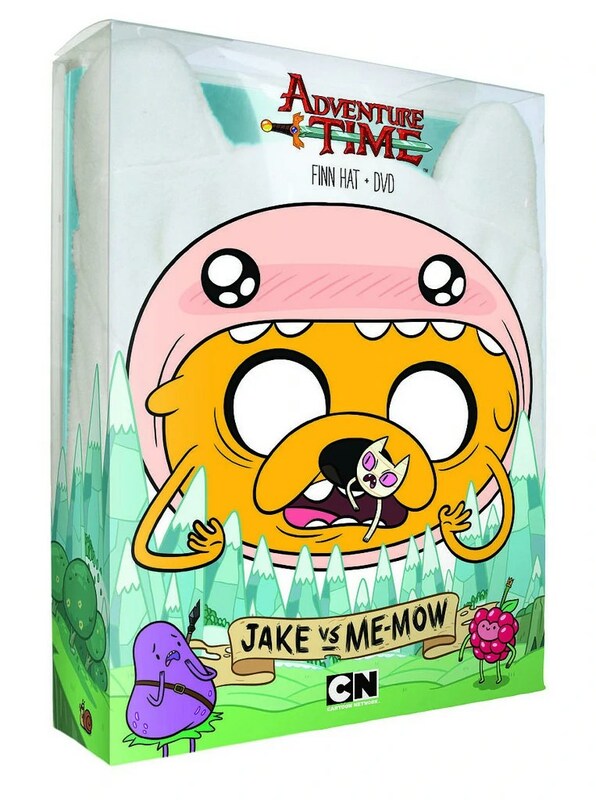 No, Adventure Time‘s second season DVD hasn’t come out yet. And no, Regular Show hasn’t made a proper first season DVD yet. They’re season-jumping once more–and this time may be the best of all. I don’t even KNOW how to describe this cover. Were they, like, holding an art contest and picked the most disgusting entry they found? “Mortal Folly” (S2 E24) – After a session of meditating on the balcony, Finn and Jake are given special gems from Princess Bubblegum like the one in her tiara, set to protect them at where they were just about to go–the chamber of an evil sorcerer known as the Lich King, currently trapped in an amber prison. The gems’ protection purposes were that just staring at the Lich without this gem would possess you, similar to how anyone who dared to stare at Medusa turned to stone. Unfortunately, at this time the Waving Snail (you might have seen him in Easter eggs cameos in select episodes) crawls in, gets possessed, and slowly breaks the Lich’s amber prison and sets him free! Only left with the gems, the Gauntlet of Billy (Ooo’s greatest hero), and a pink sweater (for Finn as a token of affection, obviously), Finn and Jake must venture on what must be their most dangerous journey yet to prevent the Lich from regaining all his power. At the same time, they must break through an equally dangerous problem–the Ice King with his persistent pesters to receive a blessing to marry PB. “Mortal Recoil” (S2 E25) – Now, I’m gonna have to spoil what happened at the end of “Mortal Folly” or else “Mortal Recoil” really won’t make much sense. Y’see, after the Lich’s defeat, the Ice King decided to pick up PB to “set her free”–but only clumsily and rather stupidly dropped her into the Lich’s Well of Power. The effect of the boiling well melted her body through–remember, she’s Princess Bubblegum–but, despite what the title card foreshadows, she did not die. She was rushed to the Candy Kingdom’s hospital, and (in a scene resembling your average super-cheesy medical drama) she was thankfully revived although she briefly flatlined. Tons of people came to see her recover, including Finn, Jake, and the Ice King. And Finn got a new pack courtesy of the princesses as a token for beating the Lich! Finn’s really put the Ice King on his blacklist now–this was clearly seen at the hospital–but he and Jake offer to nurse PB back to health. But they find some strange occurings in PB’s behavior, like crawling, heavy breathing, convulsions and other spasms. But as the day goes on, it is shown that the Well really left its mark on PB, turning her into an altered beast that Finn and Jake must fight to save Ooo and every single lifeform in it. After wrapping up the first Grayble, Finn and Jake decide to celebrate by high-fiving. But it’s not enough. So throughout the second Grayble, Finn and Jake keep upping the amps with the caliber of their high-fives, until they come out with the “super ultimate high-five“. Lumpy Space Princess is sure that her rendition of “These Lumps” would dominate the Candy Kingdom Talent Show. But when the act before her plays the exact same song (and rather well, at that) she is roped into an awkward and sticky situation. But when she discovers an unexpected and unseen talent, she catches the win from MC Peppermint Butler–well, until Finn and Jake finish their “super ultimate high five”. “Thank You” (S3 E17) – (This episode was nominated for a 2012 Annie Award for Best Animated Special Production!) They celebrated Christmas with “Holly Jolly Secrets”, they celebrated Halloween with titles like “From Bad to Worse”, now they actually celebrated last year’s Thanksgiving! And they celebrated it with a truly heartwarming and unique premise: the Snow Golem makes his third and most crucial appearance in this episode (after the original short and “Prisoners of Love”, respectively) as he decides to make his tranquil life a bit more exciting by taking a lost Fire Wolf pup under his wing. The message of the episode is that, no matter how much snow melts you get, even the most differentiated pair can share a strong friendship. Meanwhile, Finn and Jake are fruitlessly attempting to break through the Ice King’s armor layers to get back for having their sandwiches stolen. In the name of all that’s on TV, why do these two get so worked up over small things like sandwich theft?! Video of the Week: If any of you ever saw WCG Ultimate Gamer, you may have seen a contestant named Adande–or as his gamertag dubbed him, “Swoozie”. Well, although it’s been a while since WCG, he’s still got a strong YouTube channel today with nearly half a million subscribers and over 60 million video views! But 1/6 of that fame came from one series. An animated coming-of-age comedy series that, altogether, racked up 10 million hits! And 2/5 of that came from this one video. The start of the series. It is Swoozie’s history of–cheating in middle school. But you’ll find that it’s incredibly hilarious cuz it’s true, so go check out some more of Swoozie’s stuff at his channel (subscribe if possible), but for now shove this in your face. Epic Mickey and friend(s) are back in not one, but two epic sequels! I already informed you about information like Epic Mickey officially receiving a sequel, and the tons of debuts the new sequel was gonna have: Oswald making his playable debut, the series making its debut on console and computer alike, the new modes in the game, its plot and list of tentative titles, and even its possible date: holiday 2012. Well, you’re about to add more to what you already know, because Epic Mickey and company are coming back later this year, but not in just one sequel, but two! The NP cover story issue isn’t hitting the markets until tomorrow, so be lucky I’ve got this exclusive info for you. The two sequels will be The Power of Two for the Wii, and The Power of Illusion for the 3DS. Get your paint and thinner ready, folks—you’re getting more opportunity than you even bargained for. Although I showed you four possible covers for the game that were competing for the ultimate and official title, they basically all lost to another cover that I honestly believe doesn’t parallel as much, but is still kinda cool. GameTrailers also stated that their March 22, 2012 episode would involve a “world-exclusive preview of Warren Spector’s new epic adventure”, and it would be “notably significant.” Tons of clues and mind-boggles later, Warren finally confirmed that the rumors were true on the 21st, and that the title of the game would be Power of Two, and would feature new parts of the city as well as old ones ruined by earthquakes and other natural disasters. But luckily, for us, I confirmed this information even earlier. Not to be a showoff. Warren said that over 700 people would be part of the sequel’s crew, and that over a thousand alters were made to the camera issues that were criticized in the first game. Now, about the plot. Taking place some time after the original title, the Mad Doctor (whom Mickey had defeated in the original), mysteriously returns to the Wasteland, despite being presumably blown up in the original game. [This reminds me about a metaphor you could always use in these peculiar situations: when Kenny dies in South Park, he almost always comes back for the next episode he appears in.] Claiming to have realized the error of his ways, ironically enough, he offers to work alongside Oswald and other Wasteland residents to mend the damage caused by earthquakes in order to make a few amends. Giving him the benefit of the doubt, Oswald accepts the Mad Doctor’s helpful plan for the city. However, not long after this, the Wasteland suffers even more wear-and-tear than before, and suspicion rises that the Mad Doctor is not keeping to his own truth. Gus the Gremlin, Oswald’s buddy advisor, and his girlfriend Ortensia (confirming that rabbits can actually have love lives), all come to a conclusion: “When there’s something strange in the neighborhood, who we gonna call? MICKEY MOUSE!” And apparently this is the best possible plan since Mickey had saved Wasteland in 2010. Mickey climbs through the same mirror that he did in 2010, retrieves his magical paint-and-thinner brush from Yen Sid’s workshop, after having it taken away at the end of–gee, this game has a lot of tie-ins to its predecessor, doesn’t it? With the help of Gus, Mickey returns to the corrupted Wasteland to uncover the truth behind the Mad Doctor’s “little white lie”, with Oswald as a sidekick along the way. And indeed, they discover that the Mad Doctor had tricked them, using his helpful offer as an excuse to create and release his new works known as “Blotworx” into the already troubled districts, hybrids of the original game’s Blotlings and Beetleworx. Realizing his mistake that could cost him the life of the city, Oswald becomes Mickey’s assist in taking down the Mad Doctor once again to fix a mess he himself had started. For Wii users, your game will be developed by Junction Point Studios, but for PS3 and X360 users, yours will be from Blitz Games. For everyone, it will be published by Disney and distributed by Buena Vista, running under the Gamebryo engine, used by companies like 2K Games, Ubisoft, and Sony. Instead of coming out in the holidays of the year, it will instead come around the fall season in September. Waiting 5 months isn’t all that bad, is it? If you can’t wait, you can always hitch up the Nintendo Power April issue and get your fix before the primetime release. Yep, this is the final cover art. Not some fake that I made to be show-y…POST APRIL FOOLS! You totally fell for that, didn’t you? Yeah, this is just a fake I made, but at least it looks cool. And, Disney, if you’re coming up with a cover for Power of Illusion, you could always use mine under my 100% permission, but only with 5% of the game’s financial revenues. Anyway, Power of Illusion will be an apparent 3DS-exclusive Epic Mickey sequel, and it will probably be the second of the two sequels, as its date is not yet determined. So, the game is basically a sequel’s sequel. This time, a company named Dreamrift will be grabbing the reins of development, and Peter Ong will be designing, but Disney and Buena Vista still have their jobs. It is not yet known what engine it will run on, but it has been spreading that the sequel will possibly be running under hand-drawn sprites and scrolling backgrounds, which Spector has confirmed as true. The plot for this game is completely irrelevant with that of The Power of Two, but still takes place after the original game. In this, the evil witch Mizrable (good name), and her Castle of Illusion, have accidentally been transported to the Wasteland thanks to the wizard Yen Sid, the same guy with the workshop Mickey got his brush back from in Power of Two. Oswald tells Mickey the news, but also adds that Minnie Mouse has been detected inside. So now, for his second sequel, the two are on a mission to save not only Minnie, but the “Illusions” of other trapped Disney characters inside the castle. The 3DS mechanics of the game basically resemble the game Scribblenauts; where you must write out words to convert them into real objects. In this game, you must trace out those objects to bring them to existence. And for people who aren’t the best illustrators, that’s a bad thing, since the quality of your drawings reflect on the quality of the drawn object. Nintendo Power used a cannon as an example. A well-traced cannon will only inflict harm on enemies, but a badly traced cannon can inflict harm on everyone else, even Mickey! Each stage of the game will resemble a different Disney animated feature. Some announced ones include Peter Pan, Sleeping Beauty, and even Tangled. So are you excited for these sequels? I know I’ll be checking the ratings in September this year to see if I should pick it up! Anyway, I’ll give you one last thing to participate in before you leave. Mwak out. p.s. Time for our Would You Rather o’ the Week! Would you rather…every time you go #1 in the bathroom, it lights on fire, or every time you go #2, it blows up? Hey guys it’s Sam, with my first post of November! Did anyone have a good Halloween, and a good Halloween special? Of course you did; I’m the one narrating it. Anyway, I went to Illinois with my dad and sister a couple weeks ago, and we went to a baptist church. Although they were closed most of the time (in a dreamless sleep), my eyes were really opened towards Jesus Christ. What do you mean you don’t know who He is? He was the one that died on the cross to forgive our sins, he rose again on the 3rd day, and all that jazz. Well, not only did the super-super-super-super-olden times people write over one thousand pages about his adventures that now ranks as the best-selling book ever, but probably tens of thousands of people loved Him so much, they grouped together and made bands in his mercy. The first one I’m going to talk about is the 28-year old Hillsong Church from Australia. With a seat count of over a thousand Jesus freaks (no offense), Hillsong began way back in late summer 1983 in the exact same city our beloved AC/DC began…the capital, Sydney. A Pentecostal “megachurch”, pastors Brian and Bobbie Houston began the church as the Hills Christian Life Centre in, not on, Baulkham Hills. Over 20,000 people attend services each week. Their music has topped Australian charts, scoring both gold and platinum hits. The main live Hillsong has 21 albums (counting the upcoming 2012 one) since mid-summer 1992 with The Power of Your Love. But then the name started to branch, and pretty soon came the births of all sorts of Hillsongs, including Hillsong United, Hillsong London, heck, even Hillsong Kids! The most recent album to date is God Is Able, releasing at the end of July this year as the twentieth album. Songs on the list include “Go”, “Alive in Us”, the title track “God Is Able”, and “The Lost Are Found”. I personally have some Hillsong favorites. The first song was “Evermore”, the third track from their thirteenth album (lucky number) in 2004, For All You’ve Done. I like this song not just because it has the most epic guitarists ever on a live worship song, it also has a good Christian theme in the song. The next one was “Desert Song” , also the third track of their seventeenth album in 2008, This Is Our God. This song is one of my favorites because…dang it, why do their guitarists have to be so awesomely trained? Another band my family likes is called Jesus Culture, straight out of Redding, California in 1999 where the first-ever conference was held. This ministry hosts 3 conferences in their “birthplace” every year, alongside Las Vegas, Dallas, Cleveland, and more. We got more recently introduced to it than Hillsong, so we don’t know as much good songs…or at least I don’t. That song is the only favorite I can remember, “Your Love Never Fails” from their fifth album last year, Come Away. I also gotta give some thumbs to the guitarists here. It is so that every worship band has to have some amazing instrumentalists. An old band that we used to like is an Australian all-boy band called Newsboys, originating from one of the most…interestingly named cities I’ve seen since Germany’s Dusseldorf, but this one is called Mooloolaba. Read now, LOL later. Got it? This group has been alive for twenty-six years since 1985, and they’ve been making pretty good music through their career. Did you know that there were twelve former Newsboys in the past? That has to be a world record of a band with the most former members. Their first album rang in 1988, called Read All About It, and their latest album, Born Again, came in summer 2010. Check out a couple of their songs! Some of the world’s most classic Christian songs. Period. Need I say more? And the experience doesn’t stop there. There are lots of other worshiping groups out there that have probably thousands more introduced to God’s light, including Newsboys also from Australia, but from the hilariously-named city, Mooloolaba. There are lots of ways you can get closer to God: praying, spreading the good news, reading the bible, etc! So tell me: is Jesus your homeboy? YouTube Treasures: The More, The Merrier! Hey it’s Sam with another great YouTube treasure, mateys! (Why do I keep saying that?) And if you are a modern-day person, don’t watch TV, and/or might not have a life, you may not know Looney Tunes. Be as it may, it may be the most timeless cartoon the networks have ever seen. And now that it’s gotten a 2011 rejuvenation, we now know it with The Looney Tunes Show, bringing every old-school character and possibly converting them into the most new-school people I’ve seen. And that’s what today is about. While we may not be focusing on the show in general, we’re focusing on one of my favorite aspects of the show: “Merrie Melodies”. This is the title card of the first Merrie Melody from the thirties. Merrie Melodies are songs (usually 2 min. at most) featuring classic Looney Tunes characters singing original songs. If you don’t ROFL at these videos, then you have no emotion. Hands down. There are actually lots of YouTubers that release TLTS melodies. And I actually give you extra points if you have some of these on iTunes or Windows Media Player (at least a music player in general). Some videos have gotten over 100,000 views while others haven’t, but it’s the song that counts. p.s. This post is dedicated to my friends, Benny and Jerry Kagumba. Why? Because they were the first to witness this awesomeness…and they’ve been with me for years now. So, if you’re reading this, this is in your honor. NEW FRED MUSIC VID!!! (“Who’s Ready to Party?”) – Commenter Question Contest Sign In! Hey guys it’s me at Sammwak where you’ll be fooled by my cool. Now anyways, as you can see, a new Fred music vid has been released!!! U guys know my series of MUSIC VIDS!!! Well, here is a new addition to my Fred videos following “Don’t Forget to Brush”. Now this one came out, like, 4 days ago, and it’s called “Who’s Ready to Party?” So I guess it’s about, I dunno, partying? But if you like Fred, parties, and stuff that’s O.F.F. T.H.E. H.O.O.K., may a delicately perfected combination of these be lying upon your eyes. Now thx for reading another episode of the TV show of Sammwak. (I don’t rly have a tv show :D) Please like it, and if you want to, subscribe so that you may get access to new posts via email notifications n all that other coolio stuff. This has been Sammwak. Signing out. 1. Either comment or email me, involving a commenter question within your email/comment. All you have to do is type ‘I am signing into the Commenter Question Contest.’, then put your question. 2. At the end of the week, I’ll post a really special Commenter Question Contest post that involves all of your questions, and then I pick one which is the most creative and/or interesting comment/email. The grand prize winner (aka the guy who gets picked) wins a link to their email! They shall see an email sent from yours truly (ME!!!!)! And also, they will get a link to…well, I guess, you will just have to win and find out. Honorable mentions (aka the people below 2nd and 3rd) will receive a prize that is TBA (to be announced). So email me your commenter questions, and ur commenter question could end up on my special post, and u will get a HUGE prize! So, there rly is no commenter question today, because all of u have to make some! So when u r done, leave them in the comments section above. Or at my email at Gmail. So thx for watching the next post in Sammwak…where it’s so cool, u will be fooled. COMMENT COMMENT COMMENT/EMAIL EMAIL EMAIL!!! THE COMMENTER QUESTION CONTEST HAS FINAL RESULTS AT THE END OF NEXT WEEK!!! HURRY IN BEFORE IT’S TOO LATE!! !